In New England, the law of the land is baseball. In this corner of the US, Opening Day is like Christmas, St. Patrick’s Day, the 4th of July, and the day after Easter combined. Many of these people’s families have been living in the same house, on the same street, for hundreds of years. For the last hundred, they have lived and died by the fate of the Yankees, Red Sox, Dodgers, Mets, Blue Jays, and Giants. These are passionate fans who take baseball season very seriously at all levels of play. They celebrate their greatest heroes and forever berate and shun the scapegoats of their greatest failures. I experienced this three days after I moved to Massachusetts. On January 4, 2011, the Brockton Rox (a minor league baseball team in Brockton, Massachusetts) announced that they had signed Bill Buckner on as the team’s manager. It was considered a risky move by many and in my part of the state, most Red Sox fans were in disbelief that Buckner was allowed in Massachusetts. In his 20 year career, Buckner had more than 2700 hits, 1200 RBIs, batted .289. and stole 25 or more bases in 10 of these seasons. However, all anyone in Boston can remember him for is the “Mookie Error” from Game 6 of the 1986 World series. It is this error, that makes it more acceptable for me to yell out the F-bomb in a church than to say anything positive about Bill Buckner in a Massachusetts bar. This is the fate of infielders. They are paid for their bats but they are remembered for their gloves. In Buckner’s case, he is forever shunned for the time that his glove was not so reliable. Though David Ortiz, Curt Schilling, Johnny Damon, and Dustin Pedroia have since eased this pain, many in Red Sox nation still cringe at the sound of his name. Buckner’s career, like many others, has been defined by something so frail as a single moment. For Buckner, he is not remembered for his greatest moments but the severity of one mistake. As I continue my bid for the perfect game, I will be using this installment to select the rest of my starting infielders and utility players. Like Buckner, they had their share of mistakes and like Wamsganss they had their great moments. More than a single moment, these are all men who are remembered for continued superiority on the field and for entertaining and inspiring millions in the process. Some positions, like shortstop, were extremely difficult to determine while other positions (third base) were so obvious that in the tradition of the Bluth family all I could say was, “That’s a freebie” and be thankful for such an easy decision. Signature Moment: In Game 4 of the 1992 ALCS, Alomar went 4-5 and hit a home run off Dennis Eckersley that tied the game 6 -6 in the 9th. The Blue Jays won the game 7-6 in 11 innings and took a 3 – 1 lead over the A’s. 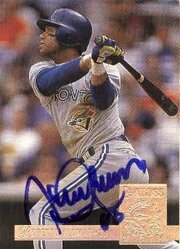 Fun Fact: Roberto Alomar will (more than likely) be the first player to ever go into the MLB Hall of Fame as a Toronto Blue Jay when he is inducted in July of this year. Signature Moment: On April 15, 1947 Jackie Robinson made his MLB Debut at Ebbets Field. In doing so he became the first black player since 1880 to openly break Major League Baseball’s color line. Fun Fact: Jackie Robinson was the first athlete to ever play in four varsity sports at UCLA – Football, Baseball, Basketball, and Track. He was a national champion in track and of these four, baseball was his worst sport. Jackie Robinson once remarked that, “A life has no value except for in the impact it has on others.” He should know because even today, nearly 40 years after his death, he continues to have an impact on society. He was a barrier breaker and a pioneer. He served his country during World War II. There are many reasons why I admire Robinson as a person. There are just as many reasons to admire him as a player. He made an impact from the moment he entered the league winning the inaugural rookie of the year award (and this was at a time when there was only one award for both leagues). He finished his first season with 12 home runs, a league leading 29 steals, and 125 runs scored. In 1950, he would lead the National League in double plays with 133. If anyone wants to understand how valuable Robinson was to the Dodgers, in his 10 year career he led the Dodgers to 6 World Series appearances. And the thing I think I love most about Robinson, is his loyalty. At the end of his career, the Dodgers sold his rights to the New York Giants. Rather than play for the rival Giants, Robinson chose to retire instead. Signature Moment: On September 6, 1995, Cal Ripken, Jr. played in his 2,131st consecutive game breaking a 56 year old record held by Lou Gehrig that many thought could never be broken. Ripken’s streak ended voluntarily in 1998 at 2,632 games. Fun Fact: In 1987, Cal Ripken, Sr. took over as manager of the Orioles and Cal’s brother Billy played second base marking the only time in MLB history that a father has penciled in his own two sons into the lineup card at second base and shortstop. And here is my favorite double play combination re-united with Alomar and now Ripken. My good friend Rodrigo has a saying, “How do you stop number 8?” For twenty years, American League ball clubs tried to figure this out and for twenty years they found no answers. Cal Ripken, Jr.’s advent into the Major League marked a significant change in the way we view shortstops today. Traditionally these had been speedy, smaller players. But at 6’4″, 225 lbs. and with a powerful bat, Ripken brought about the era of the power-hitting shortstop and today players like Alex Rodriguez, Hanley Ramirez, Nomar Garciaparra, and Miguel Tejada are often seen as a reflection of this. There is not enough that I could write about Ripken – in this case the numbers speak for themselves. He was an All-Star in 19 of his 20 years in the league and in 1991 became the first player to both win the Home Run Derby and be named the MVP of the All-Star game. He was so great that he was named the AL MVP in 1991 despite the fact that the Orioles were below .500. And of course, the greatest thing about Ripken was that he was always there for his team. In good times and bad he was there as he started an MLB record 2,632 games at shortstop and third base breaking Gehrig’s mark by 502 games. This is one record that I believe will never be broken. Signature Moment: In Game 5 of the 1985 NLCS, Ozzie took the plate batting left (he was a Switch Hitter) and despite having never hit a left handed home run prior, hit a game-winning home run that prompted announcer Jack Buck to make his now famous “Go Crazy Folks! Go Crazy!” call. The Cardinals would beat the Dodgers and advance to the 1985 World Series. Fun Fact: Ozzie Smith’s son Nikko made the top ten finalists during the 2005 season of American Idol. Has anyone ever had as much fun on an infield as Ozzie Smith did? While Ozzie is one of the all-time greats, this selection has not so much to do with his greatness and more with the fact that he was just plain fun to watch. It was a tough decision to go with the Wizard over Mr. Cub, The Flying Dutchman, and The Kid and in the end I decided I had to take Ozzie but his selection of shortstop would come with one simple requirement – he had better do one of his famous back flips the first time he takes the field. Ozzie was so fun to watch that I always felt bad he could not have won a few more rings but then when I realize his only other two chances were World Series losses to the Twins and Royals – I don’t feel so bad. No one else ever played the middle infield with quite the brilliance that Smith did. He won the NL Gold Glove for shortstops for 13 straight seasons. When he retired he held the MLB record for assists with 8,375 and for double plays with 1,590 (since broken by Omar Vizquel). This latter stat is extremely important because at the end of the day, you select a shortstop because you want that potent double play combination and I can only imagine what him and Jackie could accomplish out there on the same field. As a batter, he was always good to get on base and once there he was deadly. In his 18 year career, he averaged 32 stolen bases a season. While this was the toughest position decision I have made so far, there is no doubt that I would want to see the Wizard out there between 2nd and 3rd doing what he does best – delivering in big moments and entertaining the fans. Signature Moment: On July 24, 1983, against the Royals biggest rival, the New York Yankees, George Brett hit a 2 run home run in the top of the ninth with two outs to put the Royals up 5 – 4. After Brett had rounded the bases, Tim McClelland called George Brett out because there was too much pine tar on his bat. This nullified Brett’s home run and George Brett angrily charged the umpires and was instantly ejected. After a successful protest by the Royals, the game was resumed from the point of Brett’s home run on August 18th and the Royals won. Fun Fact: George Brett is the only player to ever win a batting title in three different decades. He did so in 1976, 1980, and 1990. Is anyone that really knows me surprised by this decision? I have a certain affinity for the Kansas City Royals and having grown up in Missouri, I fully understand who George Brett and what he means to that organization and city. In my life I have met 12 guys named Brett (after him) and know that on any Little League team in North Missouri, 5 is one of the most fought over numbers. I have always been a George Brett fan and never having seen him play live, I would love to see him take the field. While he may not be the greatest fielding third baseman (that distinction should belong to Brooks Robinson) to ever play the game – he is one of the most complete. As a hitter, he is one of only four players all time to finish his career with more than 300 home runs, 3000 hits, and with a .300 average. SPOILER ALERT – Those other three guys are going to make my team as well. Aside from those things, Brett played the game with pure emotion. Everyone has seen that angry outburst of his during the Pine Tar Incident and on the other end of the spectrum him celebrating the Royals 1985 World Series win. Brett captured America’s attention in 1990 when he carried a .400 batting average into September in an attempt to become the first player since Ted Williams to finish a season with a .400 average. He ended that season with a .390. Not too shabby Mr. Brett, not too shabby. Signature Moment: On April 17, 1976, in a game against the Chicago Cubs, Mike Schmidt became the 10th player in Major League Baseball history to hit 4 home runs in one game. He is one of only 2 members of the 500 club to have accomplished this feat. Fun Fact: Mike Schmidt is one of only three major leaguers to be inducted into the Little League Hall of Fame. I am really jealous of anyone who had a ticket to any game in the 1980 World Series because in my opinion it was a match-up of the two greatest third basemen to ever play the game – Mike Schmidt of the Phillies and George Brett of the Royals. Most authorities consider Schmidt the best player to ever occupy the “hot corner” and it is really hard to argue As a defender, he had a powerful arm and is still remembered for his ability to field short grounders bare handed. In 1974, he had 404 assists – a record for third basemen. And as a batter, he was deadly. In 1976, he hit 12 home runs in the first 15 games of the season. He was one of only two players to hit 300 home runs in the 1980s. He holds almost every single season and franchise record for the Philadelphia Phillies to this day. His selection as the starting third baseman for the National League was an easy one. When I was young I woke up every Saturday morning and poured myself a bowl of cereal and sat down to watch cartoons with my brothers. Over the years the ABC cartoon line-up changed from Duck Tales to Darkwing Duck to the Cowboys of Moo Mesa to Recess but the one constant was that every morning ended with Looney Tunes. I always loved Bugs Bunny and remember one of my favorite episodes was “Baseball Bugs” where the Gas House Gorillas take on the Tea Totalers. The Gas House Gorillas are winning 41 – 0 and then Bugs Bunny decides to play in the game for the Tea Totalers. He ends up playing every single position on the field and single handedly defeats the Gorillas 96 – 95 by climbing up the Statue of Liberty to make the catch that saves the tying home run. In all reality Bugs Bunny was the ideal utility player, a character who could play any position and fill in for anyone else at a moment’s notice. The players I have selected below were not utility players but in their prime could have played a multitude of positions and would be the ultimate utility players for such an all-star cast. Signature Moment: In the 1970 World Series, Robinson was named the MVP after batting .429 against the Reds and being the defensive spark for the Orioles. Fun Fact: Robinson met his wife Constance on a team flight from Kansas City to Baltimore when she was a flight attendant for United Air Lines. He was too shy to talk to her but kept ordering iced teas to get her attention. They made a date to go out by the end of the flight. If not for the fact that I consider myself a Kansas City Royals fan (second only to the Twins) than my decision for an AL third baseman might have been a bit harder. Regardless, I knew that I had to get Brooks on my roster and what better role than as a utility player? While he spent his whole career playing third base, he had the speed, arm, and defensive prowess to play 7 out of the 9 positions on the diamond. Additionally, he always delivered in big time moments. Take the 1970 postseason for example. In that year’s ALCS, he batted .583 against the Minnesota Twins and followed that up by hitting 2 home runs and batting .429 in the World Series against the Reds. Meanwhile making several plays on defense that have him considered the best defensive third baseman, and maybe the best fielder, of all time. Reds Manager Sparky Anderson said about Robinson after that series, “I’m beginning to see Brooks in my sleep. If I dropped a paper plate, he’d pick it up on one hop and throw me out at first.” Don’t get me wrong – Brooks had his flaws. He hit into more triple plays (4) than any other player in Major League history. Nonetheless, his 15 consecutive Gold Gloves are unprecedented and I am starting to think what I would really like to see is some kind of fielding competition between Robinson and Honus Wagner. Signature Moment: On September 11, 1985, Rose hit a single off of Padres pitcher Eric Show into left field. That was the 4,192nd hit of Rose’s career and put him ahead of Ty Cobb as the all-time Major League hits leader. Fun Fact: Pete Rose was given the nickname “Charlie Hustle” by Yankees Hall of Fame Pitcher, Whitey Ford in his rookie season after Rose sprinted to first base after being walked. How good was Charlie Hustle? He made the All-Star game at an unthinkable 5 different positions! (1B, 2B, 3B, LF, & RF) If that does not make him a great utility player option what does? Aside from the fact that he played 5 different positions extremely well, there is the fact that if the NL put him into pinch hit they would feel confident that he would feel safely. Why? Because he did it more than anyone else in history. Right handed or left handed pitcher it wouldn’t matter because the greatest hitter in the game was also it’s greatest switch hitter. Yes, he bet on baseball games and yes, he can be a bit rough around the edges but on the field Pete Rose was a great player and I will say it right now – it is a shame that the holder of the second most impressive record in all of baseball (I consider Ripken’s consecutive games streak the most impressive) is not in the Hall of Fame. I would love to see Rose playing in any position, just as long as I could watch him hit. For me as I would lean back in that rickety old stadium chair, I would think to myself, “Yep, this is the perfect infield.” I know many would disagree with my selections and be surprised at some of the names left off or not even considered but for me, so far this game is perfect. And as I would watch Brett warming up, I would see more guys emerging from either dugout and realize that there are still reserves for the infield that I have not seen yet. Maybe some of the guys I want to see will still be a part of this game? In the 5th inning, I will select the rest of my infield as I continue my bid for a perfect game. This entry was posted in M&M Gems and tagged Brooks Robinson, Cal Ripken Jr., Devan Dignan, George Brett, Greatest Game, Jackie Robinson, Mike Schmidt, MLB, Ozzie Smith, Pete Rose, Roberto Alomar. Bookmark the permalink. doesn’t have to be your world.